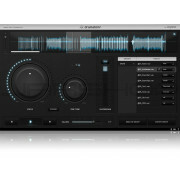 This nice little M/S tool can be used for a wide variety of sophisticated applications: chain any stereo plug-in (even tools from other vendors) into the Brainworx M/S matrix, control the Stereo Width, or mono out bass frequencies of stereo signals with our unique Mono Maker tool. bx_control V2 offers solo listening to M (mono sum), S (stereo difference signal), L (left channel) or R (right channel) phase-corrected and mono-ed on both speakers or "in place" with its four dedicated solo buttons, another Brainworx invention. Easily swap channels with its L/R flip button. bx_control also is a perfect M/S Recording Tool:Use it as a latency-free M/S matrix in recording sessions.